Almost 400 players already attended our open tryouts. One of the largest programs in South Florida. We offer both recreational and competitive teams. We strive to provide an environment for which the girls can be proud and call "home". We are looking for skilled players to tryout for our COMPETITIVE TEAMS that will start league play in the Fall Season 2018. ADDITIONAL FREE Open tryouts dates have been added to help for those that could not attend during the school testing week. Each player needs to attend only one (1) session. Bring water, shin-guards, soccer cleats or turf shoes. Check-in at arrival. New players bring birth certificate. REGISTERING for TRYOUTS does NOT commit a player to register for the upcoming season, nor does it confirm that a player has been selected for a team. Tryouts are open to all players of proper age. We have taken the time to address some of the questions regarding the move of the tryout date in a Q&A format. Please click HERE to read. The seasonal is August through June. You can expect 2-3 practices per week. Preseason, Regular Season and Postseason games will be played all over South Florida (league/age group specific). 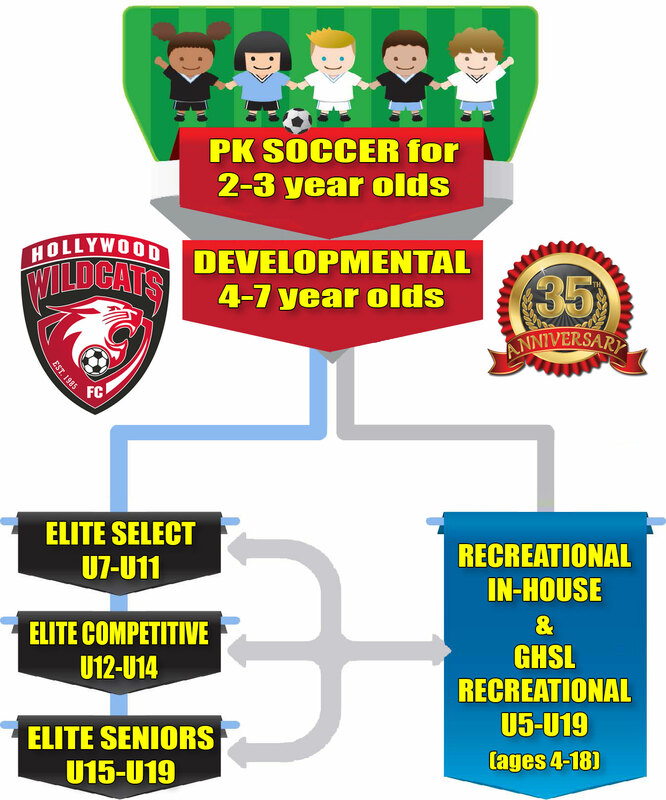 The Hollywood Wildcats Elite Competitive Program is modeled after the European Club System. It brings together a community of players, parents, coaches that work together to create a safe, healthy, and enjoyable place to learn and grow as athletes. We are the oldest member of the Florida Youth Soccer Association (FYSA) in Hollywood and part of the FIFA. We follow each player from the moment they register in any of our programs. They are continually assessed for improvement and placed according to their needs. We pride ourselves on keeping communication open with parents to better develop the person and the athlete. The Elite Competitive Program is central to our philosophy since most of the participating players will be in the program from 8 years old until they graduate from high school. The bond created between players, parents, and staff during these formative years is strengthened by the successful development of each individual player. We are dedicated to making them reach their maximum potential. The Wildcats Elite Competitive program is for qualified players from U8 to U18 that would like to reach their maximum potential. Our goal is to provide the most up to date training methods to develop young athletes. The program allows our young athletes to compete against top teams from the tri-county area, play in FYSA sanctioned tournaments, Play in Regional tournaments and eventually play in the State Cup. Our program runs throughout the year with four important periods. Summer Period: The summer period is a recuperative time from June to Mid-August. Players who need/want more work on their skills are afforded it, and those on vacations are allowed to take well deserved time off. Fun pickup games, and Summer League play is possible depending on South Florida weather and field/League availability. Competitive Season – Although the competitive season is the longest period of the year, players and their parents will find it to be the most memorable. It is a time when players become teammates and make friends that will last. Players will be asked to prepare for competition and will practice 2-3 times per week for 90 minutes. Half of the games will be played on their home field, and the other half will be in the tri-county area. Competitive Soccer – is it right for my child? Thank you for your interest in our competitive soccer program. Hollywood Wildcats FC is very proud of the coaches, parents, and especially the children who make up our Elite (Competitive and GHSL) teams. While we are hoping to use this forum to explain how competitive soccer works, we strongly encourage you to talk to friends and neighbors about their experiences, while recognizing that each team has a unique character. What is the difference between recreational (in-house) and competitive soccer? In our in-house program, all children who register on time will be assigned to a team and will receive equal playing time. Ability is not a factor, and all interested players are welcome. Coaches are almost always novice, and usually are parent volunteers who offer to coach their children and their friends. Elite soccer is a competitive program. All players are welcome to attend tryouts, but not all will be asked to join a team. Once asked to join, playing time is not guaranteed. Additionally, once on a team, players will continue to have to try-out every May/June to keep their roster spot. Coaches are licensed, often professionals, and bring a wealth of personal playing and training experience to the teams they lead. Travel soccer is a highly competitive world, and players’ development is of the utmost importance on competitive teams. Who should play competitive soccer? Please realize that competitive soccer is not for everyone and that in many cases, a player and his or her family may be best served by one of our other programs. To be successful in competitive soccer, children should show a high level of ability, and their families should recognize that a greater commitment, both in terms of attendance at practices and games as well as financially, is required. Generally, competitive games are held on Saturdays, but almost every team will find themselves with a Sunday game at least once during the season. They may have a game on both weekend days as well. Tournament games are held on weekends; tournaments are discussed below in more detail. How old must a player be to try out for a competitive team? Players are offered the opportunity beginning at U9(2009 birth-year for 2017/2018 Fall Season), as well as U8s playing as a rising U9s (2010 birth-year for 2017/2018 Fall Season). Try-outs are held every year in May/June, and all interested children in an age group are encouraged to attend. Try-outs are essentially handled like a practice, with one coach leading the sessions. Ball control, foot skills, speed, an understanding of the game, and the like are assessed by the coaches. Within a few days, coaches may offer a roster position to a player or may call to discuss areas where the child should focus on improving. Being selected for competitive sometimes means that we see a potential in a player which might or might not materialize. It is up to the club, coach, PLAYER, and PARENT to do their best to bring that potential to fruition. Please note that for many age groups, children have the option of two or more teams within the club; they are encouraged to accept a slot from the best team to offer one, but this is not required, and the final choice is the player’s. All teams in a specific age and gender hold tryouts together. The more advanced, or “A” team will make the first selections and contact players. The next team will then be able to make their choices and contact those children. It may take a few days to hear from a coach- do not despair if there is not a phone call the night that the last tryouts take place! Every player will be contacted, regardless of the outcome. U9 and U10 teams play 7v7; therefore a roster will have not more than 12 players. At U11 and U12, the teams play 9v9 and rosters cannot exceed 16 players. 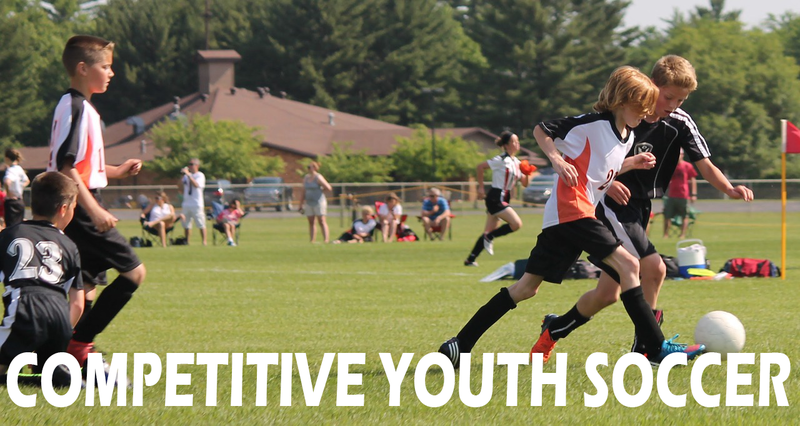 At U13 and older, the teams play 11v11, and roster sizes can be increased to 18. However, many coaches choose to select fewer than the maximum number of players allowed to increase each person’s playing time. Nobody wants to have a child sitting on the bench for long periods due to enormous rosters. Again, many age groups have multiple teams, and sometimes insisting on placing a player on a team with his friends is not where that child will be best served. What, specifically, does the “travel” part of Competitive Soccer entail? While many families, especially those considering this level of soccer for the first time, fear that by "travel" they are committing to going to Orlando or Tampa every weekend throughout the season, this is definitely NOT the case. League games- roughly 12 of them per season- are played in the South Florida area. You may end up playing a game in Kendall, or South Palm Beach County, or Key Biscayne – but you’ll have about half of your games at ‘home’ on Wildcats fields. You may have some ‘away’ games nearby as well, in Hollywood or Hallandale or Pembroke Pines or Davie for instance. Traditionally the competitive league attempts to group the children geographically, although it is not guaranteed that there won’t be some games at a greater distance. Tournaments comprise a large part of the competitive soccer experience, and the children love them. Tournament weekends mean a team will possibly play two games on Saturday and at least one on Sunday, with the possibility of more Sunday afternoon if the team reaches the semifinals or finals. Most teams play two or three tournaments per season. These often take place in the off-season, but may be held on Labor Day, Columbus Day, and Memorial Day weekends, and sometimes on the weekend following the last weekend of league play. Most Wildcats teams play tournaments held locally. Additionally, from U11 on, higher level teams are encouraged to participate in Commissioner’s Cup, or President/State Cup play. My child enjoys other activities, like dance or baseball- will that be all right? Many competitive soccer players participate in other activities. The coaches understand this. However, it is expected that a player’s primary commitment is to his or her soccer team. How many hours per week will my child practice? Generally speaking, competitive teams practice twice a week for an hour and a half during the regular season. Additionally, we have a third night with a special trainer to work on a specific aspect of the game such as conditioning, goalkeeping, shooting. I’ve heard competitive soccer is essentially a year-round sport? Generally speaking, competitive teams train and play, about 11 months out of the year. After tryouts in June, July is a quiet month for competitive soccer players and most families opt to take their vacations then. Regular practices begin approximately with the school year. League play begins in October/November. The league season usually ends in February/March. Teams take a brief break for Christmas. There are teams who continue playing in tournaments and mini-seasons through May. Try-outs take place again in May/June. Coaches are thoroughly interviewed and vetted by the Director of Coaching, Director of Operations and the Director of Competitive Soccer. Whenever possible, they are watched while training a team and while coaching a game before being offered a position. We are proud of our coaching staff, which features licensed and experienced coaches. Furthermore, a number of our coaches hold European licenses, US licenses as well as National Youth Licenses or specific accreditation such as goal-keeping certificates. Their diverse backgrounds include time spent on National teams, professional club teams in the US, South America, and Europe, and coaching experience at the high school and university level. If your children have participated in any of the clinics we offer, you’ve probably met several of our competitive coaches already. As a parent, what are my obligations to a competitive team? All competitive teams need a manager, who is a parent volunteer. This person handles the day-to-day administrative aspects of the team, such as sending emails to the team, contacting opponents before games, passing along information between Club and the team members, collecting proof of birth documents for new competitive players, getting the roster set and player cards generated, and working with the league registrars. Additionally, there are other tasks which include collecting fees and writing team checks, handling tournament applications and registration, and Hollywood Cup organizational duties. Sometimes a manager handles all of this; often it is divided among some parents. To make a high school/college team, does my child have to play competitive soccer? In a word- no. Will it help? Probably. Competitive soccer players are exposed to a fast-paced, technically advanced game. High school soccer teams are generally made up of players from a number of different competitive teams. There are players on competitive club teams who do not make their high school squads, so it certainly offers no guarantee, but children with a serious desire to play in high school should strongly consider joining a competitive team. The mere experience of trying out, accompanied by an understanding of the level of competition they will face, makes looking into competitive soccer a good decision for these children.